It all started in the wintery month of January 1933, in the historic winery building in the city Rehovot. Oranges from groves located in the area were hand squeezed using 20 manual juicers. The work was not easy and the conditions were not optimal, yet into the world a new drink was born. A drink that was the company’s flagship product at the beginning of the Jewish settlement in Israel – Mitz Paz. 1967 – Jafora establishes a new production line of carbonated drinks. Schweppes, the the first major brand in the beverage industry comes from abroad, and becomes an immediate success amongst Israeli consumers, due to its special flavors and international name. Tabori was founded in the year 1936 by Mr. Jacob Tabori and his father, Mr. Isashar Taborsky. The family plant was located in Pardes Hana and manufactured beverages. Early on, the factory produced soda water Siphon, and later juices an carbonated beverages in a variety of wonderful flavors bottled in glass bottles. With the outbreak of World War II, the plant supplied its produce to the British army, and with the establishment of the state of Israel, Tabori became a leading supplier for the IDF’s Shekem. 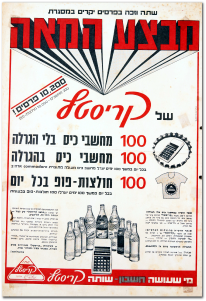 The “Crystal” product line was launched in 1936 and in subsequent years the brands “Tropi”, “Tropit” and “Spring” were added as well and were produced in three different location: Pardes Hana, Bat-Yam and Beer Sheva. Amongst its various products, the “Tabori” company has introduced new marketing and technological innovations that were unknown before in the Israeli market. These innovations have improved the taste and enhanced enjoyment. In 1990 “Jafora” and “Tabori” merge and established a new company – “Jafora – Tabori”. 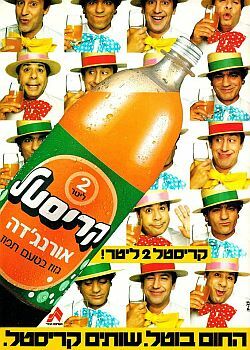 In 1992 the company began to produce and market Spring flavors ,the first nectar beverage in the market, as a soft drink in 1.5 liter bottles. In 1994 Jafora launches the brand “Tapuzina”. The first Israeli beverage containing pieces of natural fruit. in 1995 Jafora launched the brands RC and RCQ . 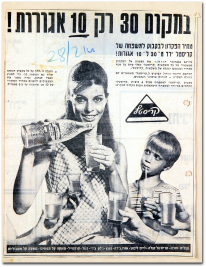 In 1997, Jafora, established together with Kibbutz Ein – Gedi, the company “Ein Gedi Mineral Water Ltd” and introduced the mineral water brand “Ein Gedi”, that soon became one of the leading brands in Israel. “Ein Gedi” consisted of the latest technological advances in the field of mineral water in the world, and was established in Ein Gedi reserve. for quality products and impeccable tastes. and most sophisticated technologies in the world. “Ein Gedi” – joint venture with kibutz Ein Gedi.